I know as I get older my sense of time has changed, I naturally invest more time in fewer people and realize I don’t have lots and lots of friends, just a few good friends. After talking to my Mom this morning who is 82 years young she relayed to me her feelings of sadness as she explained how almost all of her close friends have passed on and it was time to get a new address book and update it. My step dad piped up in the background and yelled, If you’re a dinosaur, ALL of your friends are dead. I sometimes get off the phone with them and have found a lot of the conversation hilariously morbid if there is such a thing. Another friend tells me she is not looking forward to what being older bombards us with and sadly reflects that we have less time to look forward to than to look back at. And yes I agree with her that time passes much faster as we get older. I also acknowledge to myself that hopefully we live on in the hearts that we have left behind. And Mom…. 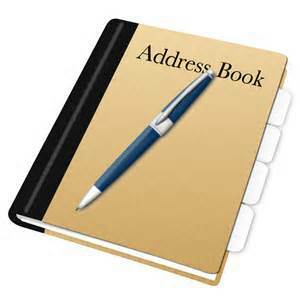 your new address book is in the mail! This entry was posted in love and poetry and tagged address book, dinosaurs, faith, friendship;, hope, love, memories, relationships. Bookmark the permalink.